· Temperature is considered to be one of the most important ecological factors as it regulates many physiological processes of the plant. · The principal source of temperature is the sun. · Its temperature is estimated to be 60000c. · Out of the total thermal energy received at the surface of atmosphere 43% is reflected back, 11% is absorbed by the atmosphere, 47% is received by the earth surface (Land + Water surface). · The energy received in the form of short waves. At the surface of the Earth, the wavelength is converted into long waves length and thereby raising its temperature. The Earth becomes hot and re-radiates heat. · It is estimated that atmosphere receives seven times more heat from earth than from the sun. · Life exists on this planet under the range of 2000c to 1000c but most of the life activity is in range of 00c to 500c. § This is the lowest temperature at which any plant can survive. § Some plants of cold areas may survive temperatures below the freezing point. § Moreover some marine Algae also survive temperature below 00c. § On the other hand, a number of tropical plants have retarded growth at about 200c and may die off at 100c. § Tropical plants are more adapted to withstand high temperature than their temperature counterparts. § Certain yeast species are able to withstand the temperature. § Seed can endure heat up to 1000c. § This is the temperature at which the vital processes going on at a rapid speed. § It is generally a range of several degrees. § In general, it may be said that the maximum daily temperature occurs between 2 p.m to 3.30 p.m.
§ Minimum temperatures occur just before sunrise. § Temperature also varies with altitude and latitude. § There is a 1oc fall in temperature for every 100 meters rise in Altitude. Winds, clouds also influence temperature to a considerable extent. · As the sun rises in the morning the Earth’s surface begins to gain heat than it loses by re-radiation. · The temperature continues decreasing the night till it reaches its minimum. · This range of variation (of max and min) is narrower in deeper layers of the Earth, and wider near the surface. · The greatest insolation, however, occurs at the equator and decreases with the distance from the equator in spite of the increasing length of the day because of the increasing angle of incidence. (a) Colour: White surface reflects all the radiations while Black surface absorbs it completely. (b) Water Content of Soil: The water the soil the lower will be its temperature. (c) Plant Cover: Temperature varies with the shade. · Radiation is most concentrated and effective on surfaces forming a right angle with the path of the rays and goes on decreasing as the angel becomes obtuse. · The amount of radiation reaching the Earth’s surface decreases with increasing latitude. · The effect of latitude on the rate of decrease of temperature is greatly modified by such factors Altitude, Topography, Winds aspect, Amount of cloudiness, distance from sea, season and duration of rain, and the isotherms very seldom conform to latitude in Pakistan except during winter, when they run fairly east and west with drop of about 1.50 F for each degree increase in Latitude. · Although eastern and western aspects receive about the same insolation, the angle of incidence is highest on the eastern slopes in the morning when the dew is still on the ground. · Southern aspects receive more solar radiation than northern. · Western and south-western aspect receive a max amount in the afternoon when cooling effects of night conditions have been lost, in contrast to the eastern and south-eastern aspects where insolation is maximum in the morning. · Altitude has a much greater affection temperature than has latitude. · The mean annual decrease in temperature with an increase in elevation has been calculation as 10F per 400 feet in N.W. The Himalayas. · The air near the earth’s surface is warmed by absorption of insolation and radiate heat’s from the earth. · With increasing altitude the atmosphere becomes less dense and also contains less moisture and other heat-absorbing substances. · Consequently the temperature declines with the altitude. When the atmosphere is in motion, however, the winds may transport the air from one place to another and the heat thus transported may mask the effect of local solar radiation and altitude. E.g. the frequent cold waves experiences in Pakistan during winter as a result of the influence of cold winds from Central Asia. These are plants of warm habitat which require a high degree of heat throughout the year e.g. of tropical climates. § Equatorial and Tropical Region Rain Forest. These are plants living in the high temperature of summer, alternating with a low temperature of winter e.g. They are found in deciduous forests of tropical and sub-tropical regions. These are the plants of cold or temperate habitat and require low temperature for their growth. Such plants cannot tolerate high temperature. They may also be found in tropical and subtropical areas at high Elevations where temperature conditions are less extreme. These are the plants of cold and Alpine regions. They do not thrive well in heat and can withstand long and very severe winter. 1. Many plants are very sensitive to temperature. The sudden fall in temperature is injurious because plant tissues are badly affected by it. 2. Forests suffer from night frost on the east side when the sun rays strike very early in the day. 3. The temperature stimulates the growth of seedlings. 4. The optimum temperature for seed germination ranges between 200c and 270c. 5. Photosynthesis operates over a wide range of temperature. 6. Most of the ALGAE require lower temperature range for photosynthesis than the higher plants. 7. The photosynthesis continues even at 800c in some desert plants. 8. The rate of respiration increases with the rise of temperature up to a certain level, but the optimum limits the respiration rate shows marked decrease. 9. Temperature determines the grow of many plants. Cotton prefers high temperature, Potato gives highest yield in low summer temperature. 10. Growth of plants is retarded at high temperature. 11. Temperature in combination with humidity and other factors helps in the spread of diseases in plants. 12. Low temperature and high humidity favour the Rust attack. 13. Low temperature, high humidity and cloudy weather favour the damping-off, seedling blight, foot rot and root-rot diseases of Cucurbits, Tobacco, Papaya, and Ginger. 14. Temperature is the most influential climatic factor in affecting the distribution of Plants. 15. The temperature is highest at the EQUATOR and it gradually falls down towards the ARCTIC. 16. Due to difference in temperature, Tropical, Sub-tropical, Temperate and Alpine vegetations have been formed. 17. The temperature determines the flora of a particular region. 18. The distribution and habitat of species is their main features are determined by heat or temperature. · Temperature of a place depends upon its latitude and altitude. · Generally mean temperature of air decreases about 50c for every degree latitude North of equator and for every 300 feet of Altitude. · Temperature also depend upon plant cover, water content of the soil, physiographic features like steepness and exposure of the slope and direction of mountains. · In terrestrial environment temperature fluctuations are varied and marked. · Desert plants grow in extreme heat, Aquatic plants grow in low temperature range and grasses prefer to grow in the area of moderate temperature. · Temperature in combination with moisture determines the general distribution of vegetation. Northern, Southern, Tropical and Temperate vegetation depend solely upon temperature and moisture. 1. Temperature influence the actual amount of water vapor present in the air and thus decides the moisture carrying capacity of the air. 2. It decides the rate of evaporation and condensation and therefore grows the degree of stability of the atmosphere. 3. As relative humidity is directly related to the temperature of the air, it affects the nature and types of cloud formation and precipitation. Temperature thus diminishes from equatorial regions to the poles. e.g. Due to earth inclination, the mid-day sun is almost overhead within tropics but the sun’s rays reach the earth at an angle outside the tropics. Since the atmosphere is mainly heated by conduction from the earth, it can be extracted that places nearer to earth’s surface are warmer than those higher up. Thus temperature decreases with increasing height above sea-level. A fall of 0.60c occurs with an assent of 300 or 10c per 164 meters. It is usually more in summer than in winter. Land surface is heated more quickly than water surface because of the higher specific heat of water. Both ocean currents and winds affect temperature by transporting their heat or coldness into adjacent regions. A steep slope experiences a more rapid change in temperature than a gentle one. Mountain ranges that have an East-West alignment like the Alps show a higher temperature on the south-facing “Sunny slop” on the north-facing “shelter slope”. The temperature may be lower in the valley than higher up the slopes. Cool in the Jungle and its shade temperature is a few degrees lower than that of open spaces in the corresponding latitude. During day trees lose water by evapotranspiration so that the air above is cooled. Relative humidity increases and mist and fog may form. Clouds thick cumulus and stratus clouds after the temperature of a place by absorbing the incoming solar radiation in the day and blanketing the out-going radiation heat of the earth. 1. Precipitation in the form of rain or snow. 2. Immediate return to the atmosphere by the process of evaporation. 3. Evaporation from different water bodies like seas, rivers etc. 4. Transpiration processes in Plants. 5. Transpiration processes in Animals. 6. Drainage by means of underground channels, streams, and rivers, which ultimately reaches the ocean. This cycle has been termed the water or Hydrological cycle. Rainfall is the main constituent of precipitation. (B) Visible vapours (Cloud and Fog). § A certain amount of water is present in a vapor state in the atmosphere. § It is believed that a total of 0.1 gm to 40 gm of water is present in each kg of Air. § Moisture which is present in the air in water vapor form is termed as HUMIDITY. § This has a direct bearing on the nature of transpiration, which in turn determines the suitability of a plant to grow in a particular habitat. § It is the actual amount of water which is present in the air and is expressed in units of gms/cubic meter or grains/cubic feet of air. iii. Altitude at which the observation is made. v. Vegetation cover of locality. § To a layman, it may seem as if the air is dry but actually it may not be so for in a given unit of air space in desert areas, the quantity of moisture present may be more than that in other regions. Hence the term relative humidity has been brought into usage. § It is defined that the quantity of water vapour in the air exposed as the percentage of the quantity of the same which the air can hold at the existing temperature. Ø The condensation of water vapor in the air due to the cooling is called precipitation. Condensation of water vapour in participles sufficiently small to remain suspended in the air above the ground. Condensation of water vapour in participles sufficiently small to remain suspended in the layer of air near the ground. Condensation of water vapour directly on the cooled surface. Condensation takes place above the freezing point. Condensation takes place to blow the freezing point. Rain that freezes as it falls through such freezing air layers. Rain if freezes as it falls on a sub-freezing surface. Ø Among all the environmental factors which affect the distribution and growing of plants, water is considered to be the most important because it is essential for all life process. Ø What is a very important nutrient for protoplasm, about 80% of water is present in the living cell. Ø It is essential for maintains of turgidity. Ø It acts as solvent through which gases and minerals are absorbed by the plants. Ø All the physiological processes such as photosynthesis, transpiration, and translocation of food material also take place with the help of water. Ø Water also plays an important role in pollination and fertilization of flowers and dispersal of seed & fruits. Ø Water covers about 73% of earth’s surface occurring in ponds, lakes, streams, and oceans etc. Ø It falls from the atmosphere in the form of precipitation and is also present as atmospheric humidity. 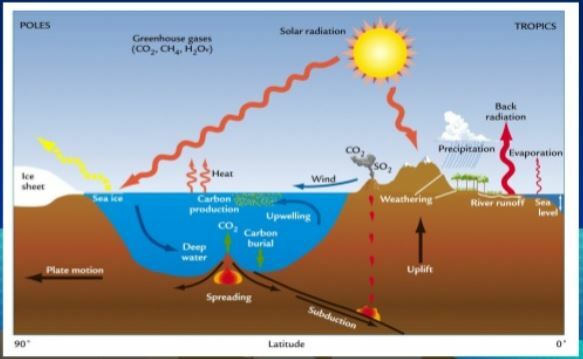 Ø In Nature water moves in more of the less circular path called Hydrological cycle. Ø Most of the plants are adapted in nature according to the amount of moisture available to them. Thus plants may be present in habitat with an abundance of water. Such as River, Ponds, Lakes, Stream etc. They may grow on the moist and swampy banks. Plants may also grow in between the scarcity and abundance of water or mesic habitat. Ø Plants are also found in PHYSICALLY DRY or PHYSIOLOGICALLY Dry localities – xeric Habitat. Ø Depending upon the habitat, plants have adapted themselves morphologically and anatomically and accordingly they are classified into the following Ecological groups. § Hydrophytes are the plants which grow in water reservoirs like Ponds, Lakes, Streams or Rivers. · These plants are fully submerged in water. · They are found in tanks, ponds, pools, rivers, streams & lakes e.g. · Free-floating plants are not anchored in the soil but are freely swimming over the water surface. e.g. · These hydrophytes are anchored in the soil and their leaves are floating on the water surface. · They occur in shallow water with well-developed roots which are fixed in the mud. e.g. § Amphibiophytes or moisture-loving plants are the emersed plants which grow on very moist and swampy places i.e. on the side of ponds, ditches, streams, rivers, lakes shallow and muddy water etc. e.g. § These are the land plans which grow in habitats which are neither dry nor wet and the temperature of the air is neither too high nor too low. § They avoid waterlogged and saline soil. § Thus they love to live in habitats which are in between the two extremes i.e. Scarcity of water and abundance of water. § Therefore mesophytes are the plants which are intermediate between xerophytes and hydrophytes. § Xerophytes are the plant living in the xeric habitat. § Xeric habitat is an area with inadequate water physically dry habitat such as found in arid regions, on rocks, gravelly and sandy soils or on steep slopes. § These plants grow in localities with a high concentration of salts and abundance of water. § One of these halophytes only found in the coastal swamps known as MANGROVE vegetation. § As a result of the non-availability of water due to the high concentration of salts in the soil, mangrove plants have adapted themselves like the presence of respiratory roots or pneumatophores. Viviparous types of seed germination and the leaf itself show all the xerophytes characters like its thickness and shining surface. § One huge mountains winds velocity is high, strong light (Rich in blue-violet layers) dry air cause excessive transpiration while low temperature (usually below freezing point) and low barometric pressure. § High altitude between the range of 8000-9000 feet above sea level. § Some plants are also found in Arctic Region. § Alpine plants can carry on photosynthesis at low temperature. § Due to the high percentage of sugar in their bodies they can endure very low temperature. § The Alpine and Arctic plants remain buried under snow of the greater part of the year but who the snow melts away he resume their normal life. § Water is a raw material for photosynthesis. § Water can absorb relatively large quantity of heat with relatively small change in temperature. Maintain the uniformity of temperature. § The intake and loss of water by plants are great concern for the Ecologist. 4. be absorbed by the leaf surface. e.g. i. 84% Reached the forest floor by direct or drip. ii. 4% Reached the forest floor by stem flow. iii. 12% Retained by crowns (which is either evaporated or absorbed). § The main source of water for terrestrial plants is rainwater. i. ARID: It is characterized by the condition in which evaporation is greater than precipitation. ii. Arid-HUMID: When evaporation is more or less equal to precipitation. iii. HUMID: When evaporation is lesser than precipitation. § The distribution of Rainfall over the year is an extremely important limiting factor for all organisms. § The mean Annual Rainfall in Pakistan is 2″ – 50″. SEE ALSO: How to determine the contribution of the Forestry sector in GNP and in Social Welfare? § Without water no vital activity is possible in the plants and animals. § Water effects the inner and outer morphology of the plants organs that together determines the physiognomy of vegetation. § The water requirements is generally met by Rainfall, dew, hail, snow. § Snow, hail and frost are also harmful to vegetation. § The distinction between equatorial forest zones, desert zones near the tropics and temperate forest zones is based upon rainfall. § More atmospheric humidity favour growth of Mushrooms, Rusts, Smuts and other parasites of plants. · The Earth is enveloped by a gaseous layer called atmosphere. · It is a reservoir of several elements to life. i. The filtration of Radiant energy coming from the sun. ii. Insulation from heat at the earth surface. iii. Stabilization of weather and climate owing to heat capacity of the air. ii. It is about 20 km above the earth surface. iii. It is a mixture of several gases. 1. The thickness gaseous envelope surround our planet. iii. Other gases = 1% (Argon, Co2 Neon, Krypton ozone etc). (b) Organic and inorganic impurities (pollen grains, micro-organisms, other industrial gases). (c) Condensed water and ice particles. · These non-gaseous substances, collectively known as Dust, Pollutants. · Oxygen and Co2 contents of the air have profound effects upon two important physiological processes of plants i.e. photosynthesis & respiration. · The gaseous mixture present in the atmosphere is called Air. · Air moving from high pressure to low atmospheric pressure is called Wind. · It plays both positive and negative roles in atmosphere. · Air in motion is called wind. · It can circulate gases, water vapour and small soil particles. · The action of wind as an ecological factor maybe direct or indirect. · In coastal regions or exposed mountain tops, plans lie in danger of being uprooted and blown away by strong wind. · In coastal region due to continuous and unidirectional wind pressure trees and their branches direct themselves towards the leeward side. · In strong winds or hurricane, branches of large trees are broken or entire trees are uprooted. · Violent winds may cause flattening of the herbaceous plants to the grounds, and it take this is called LODGING. · Mechanically wind can also cause erosion. · Wind is also important for dispersal of germless i.e. pollen grains, seeds and fruits. · Indirect effect of wind is physiological which includes the influence on the rate of transpiration of plants. · Strong wind cause increase in the rate of transpiration and plants fail to mountain an internal water balance and thus suffer from desiccation. · Under the influence of drying winds generally suffer from dehydration and consequent loss of turgidity and their organs become dwarfed. 1. Winds of high velocity are responsible for the uprooting of trees, breaking of branches, twigs etc. 2. Violent wind leads to lodging in crops like wheat, maize, rice, sugarcane etc. 3. Draw ness may result due to strong prevailing winds. 4. Strong winds also cause a considerable degree of soil erosion particularly on open, exposed slopes. 5. High speeds winds lead to more transpiration. 6. In the higher altitude of the Himalayas wind affect the distribution of trees. The tree line or the timberline is lower on windswept slopes. 7. Permanent curvatures may form in plants which are exposed to winds blowing from a particular direction. 8. Sand dunes are the result of wind action. 9. Coastal lands often get salt spray by winds blowing inland from the sea. 10. Wind pollination e.g. Oak, Poplars, Walnut, Conifers, Betula, Alnus, Chir, Acer, Santha, Populus, Salix, Grasses, etc. i.e. Desiccation, Dwarfing, Deformation, Breakage, Abrasion, Erosion and deposition, Salt spray, wind pollination and wind dissemination by the wind. 1. Wind increases the water loss in plants. 2. Mechanically, wind causes erosion of soil and abrasion of vegetation through the removal of particles. 3. In strong dry and hot winds, young parts of plants may be come shriveled and killed in a few hours and the surface of soil may become dry. 4. In strong winds big are uprooted and small plants also affected. 5. Wind is an important agent for the dispersal of pollen grains, fruits, seeds and spores of the plants. 6. Strong wind causes injuries to plant growing at high altitude. 7. In the desert, the storm results in big sand-dunes which cover the vegetation. 8. In the strong area, the leaves of the plants become small and rolled. How to determine the contribution of the Forestry sector in GNP and in Social Welfare?